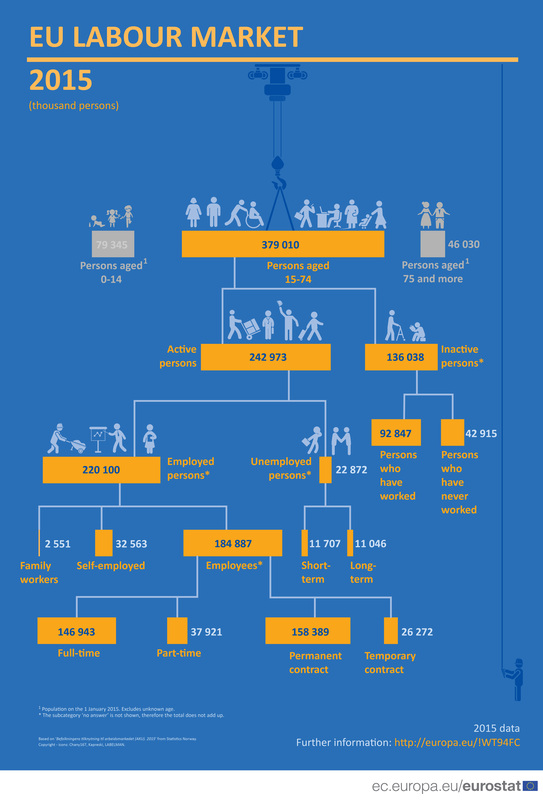 employment situation in the EU and the Member States. …that the share of employed persons aged 20-64 years ranges from 83% for people with a tertiary education level, to 71% for people with a upper secondary level and 53% for people with a lower secondary level or less? …that the share of young persons aged 15-34 who are employed between 1 and 3 years after graduation reaches 71% in the EU, but only 44% in Italy and 41% in Greece? …that the share of temporary employees aged 15 years and over ranges from about 1% of all employees in Romania to 28% in Poland? …that 71% of part-time employed persons aged 15 years and over in Greece work part-time because they cannot find a full-time job? …that more than one out of five employed persons aged 15 years and over work at least sometimes at night in Slovakia (23%) and Slovenia (20%)? …that the share of employed persons aged 15 and over who work usually from home ranges from 10% in Luxembourg to 1% or less in Croatia, Italy, Lithuania, Cyprus, the Czech Republic, Latvia, Romania and Bulgaria? If you have any comments or would like to give us your feedback on this infographic, please contact us via estat-web-content@ec.europa.eu .